Personal news and updates from Keith Drury, a "learning coach" at Indiana Wesleyan University. Jarod was one of those strong-silent-type students. He always seemed so strong to me—even before I knew him well. I later discovered why he came across this way—it was a mind set of a man with a black belt in martial arts and he was restrained in letting that power out. That’s how Jarod was intellectually too in my classes—he often knew the answers to questions and had deep thoughts yet he often kept them to himself while others filled up class discussion with shallower thoughts. I got to know Jarod best after he spent his junior year overseas. Facing radical culture shock, other flourishing religions and personal grief he experienced a major crisis of faith. When he returned to IWU he was trying to find his way again and we met often. I admired Jarod deeply as I saw him work through recovering his faith again. He is one of my models for how to face and recover from such a faith crisis. His strength and perseverance makes him the go-to guy in my opinion for young men and woman facing such a collapse of faith. Jarod worked as a youth outreach coordinator for the Salvation Army in Mansfield, Ohio, and has served in youth work for a United Methodist church in New Jersey and even served as a missionary to Uganda where he found his wife Esther. The last time I ran into Jarod was after hiking the Wind River Mountains of Wyoming with the Kinds. Sharon and I stopped by Yellowstone for chuch Sunday morning and Jarod was the summer park chaplain there—he preached a great sermon. (His pictiure that morning is above). Jarod is about to graduate from seminary. In a month or so he’ll graduate from Princeton Theological seminary, my own alma mater. I found out this week that he has just accepted a call to be the solo-senior pastor of the Vancouver Wesleyan church, in Washington. District Superintendent Karl Westfall is building up quite a cadre of pastors in that district and Jarod will be a great addition. Jarod, I’m proud of you—you’ll make a great pastor! I'm proud of Chelo & Laura! Marcelo Santana came to IWU from Puerto Rico but I didn’t get to really know him until Paul Kind invited Marcelo along for a month of hiking on the Pacific Crest Trail. On the IWU campus he was a whirlwind of energy, riding his skateboard into right into the classroom or publishing a book of ideas for “Cheap Dates in Marion” which he sold to other students who had less creativity. His papers were always different from everyone else’s since he could dream up a dozen different way to do the assignment that the professor had never even never thought of. I watched Marcelo flip for Laura Warner (who happened to be one of my favorite Christian Education students). Laura graduated in 2002 and Marcelo (AKA "Chelo") graduated in youth ministry a year later. When these two got married they moved to Ohio, Laura’s home state, where Laura taught at Head Start and Marcelo worked on a farm then later at a factory making electrical parts. But hat was not thei goal--they were praying together that God would lead them to a church. 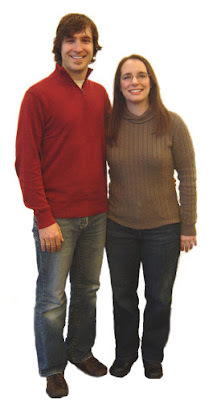 In October 2003, a year after Chelo’s graduation they were called to work at Grant Wesleyan Church in Michigan. Ever since they have been at that same church—a great church with a great senior pastor. Laura substitute taught until their daughter Elena was born and they have recently added a scond child, Antonio, who is now about 6 months old. I think they bought a house there too. Laura mentors youth and young adults in the Grant church and is a youth leader working with Marcelo who is the youth pastor/assistant pastor. Chelo is the consummate “connecter” with people—he is virtually "omnipresent" in the community. He coaches soccer, plays indoor soccer after school, hangs out at the skate parks, and even runs dodge ball tournaments in the high school gym to provide a safe place for kids on Friday nights. Lately Chelo is really into training interns for service and ministry—mostly high school seniors. His high school interns speak at children’s rallies, help the elderly, do home repair projects, learn to play instruments, and help out with local church ministries. It is an incredible thing--he runs a program for high schoolers that rivals some post-college internship prgrams. In fact Chelo sends some students to IWU who have more ministerial experience when they get here than most other students have when they leave! To connect with the Mexican community the Grant church runs a summer soccer league--getting the idea that Chelo likes soccer? Chelo is also a translator in the court system along with helping the volunteers learn Spanish. Can a Puerto Rican kid who married an Ohio girl be happy in northern Michigan? You betcha! They love their work and the people at Grant Wesleyan and their Senior Pastor loves them right back. I’m proud of you Chelo & Laura! Dave Mierau graduated from IWU in 2005 and is now pastor at LifeSpring Community Church, in Goshen, Indiana. It is a very relational, laid back church packed with mature leaders and a lot of diversity in age and occupations including quite a few students from Goshen college who attend. Dave’s church runs about a hundred people but he has five people on staff. How does he pull this off? There are five staffers each at about ten hours a week—most of them of course are bi-vocational. The staff is pretty diverse too in terms of people's ages. Dave feels this intergenerational-part-timers staff model has worked pretty well. He’s energized! I recall that Dave had a series of solid practicum experiences in college and some great internship experiences after college before he returned to Indiana to pastor this church. About a year ago he got married (to Kim) and they are partners in ministry. I admire Dave’s creativity and leadership! I’m proud of you Dave! Dustin graduated just last year (2009) with a CM degree. When he was here he was involved at College Wesleyan church and he especially focused on the college ministry of seven47. He was always active in classes and his ever-present smile in classes always made me want to continue teaching another year! Dustin started looking for internships the summer before his final year. He wanted to serve as an intern before launching into a full ministry position. He found a church who said they were interested in his coming for a summer, but they wanted someone who would consider coming back after graduation for the possibility of filling a full time position—as a continuing full-year intern. He took that summer internship, and sure enough he then went on staff as an “apprentice” there after he graduated. Dustin is at Crossroads Christian Church, a non-denominational Christian Church in Evansville, Indiana where the weekly attendance is about 3700. The high school ministry has 150 students at the Sunday night program and 200 students involved in house groups on a weekly basis. The church had been without a high school pastor for three years when Dustin joined the staff so the department head over student ministries had been fulfilling this role. That department head developed the plan of which he is now a part. Dustin (with a second recent graduate of Johnson Bible College) are both in a 1 year apprenticeship where they are mentored under the counsel of the department head (who has thirty years of youth ministry experience). At the end of this year the church will decide if it wants to take one or the other or both of them on as high school pastors. There are two high school campuses they work with so each of them takes one school. Dustin is in a school that is very open to ministries, so he is coaching the defensive line for the varsity football team where he makes vital contacts. Te church is seeing incredible growth in the youth ministry, and Dustin is excited. So am I. Dustin shows how a student can leverage a summer internship into a year-long apprenticeship which gets him wonderful experience that leads to full time full pay work there or elsewhere. I’m proud of you Dustin! I forgot exactly when Tom Cochran graduated from IWU but he and Sarah are making me proud==along with Matt Cox! I knew Tom as a student and I remember that he was always a steady and hard-working student—he was always sparking his small group to work harder and can still picture him as a “nodder”—not the kind of nodder who nods to sleep but the kind who nods during a lecture affirming what the teacher is saying egging me on. (I always need at least one in class!). Last month (2/2010) Tom bit off a huge challenge. 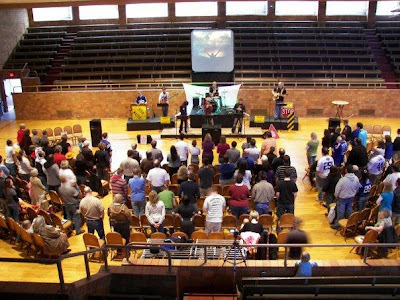 He held his first service in a new Wesleyan church plant in Wabash, Indiana—the New Journey Community Church. There were 123 people attending his first service at the “Honeywell center” there. I’m thrilled! I’ve been involved with two church plants myself as a “layman” and getting more than a hundred people out for the first service is a gigantic accomplishment! Kudos to Tom and Sarah—and to Matt Cox who is also helping out on staff! A number of people already become Christians as a result of their work in Wabash, several in the very first service. A lot of the students I teach want to plant churches so I’m especially happy to tell them about graduates like Tom Cochran who didn’t just dream but actually did it! If you want to hear Tom on this new church, see his video here. I’m proud of you Tom! People like you make teaching ministry student worth it all! Eddie Smith was impossible to miss when he was in a class. His energy, craziness and active participation made all his professors look forward to him. He was a fantastic note-taker. I remember one time his note-taking got him in trouble with Bud Bence. Dr. Bence noticed that one of his 7:50 classes had simply “gone dead.” Students seemed glazed over and few even took any notes. They listened but when he said something obviously important nobody wrote it down. It shook Bence—he thought maybe he had lost his magical touch. Then he discovered that Eddie Smith was taking perfect notes each day and emailing them to the rest of the class. Upon getting the notes the rest of the class realized they’d never be able to capture Bence as well as Eddie did so they just checked out and waited for their email from Eddie. (I think Bence talked him out of that, but if I recall correctly he persuaded Eddie to give HIM a copy of the notes—who knows, maybe he’s using Eddie’s notes now in his lectures! 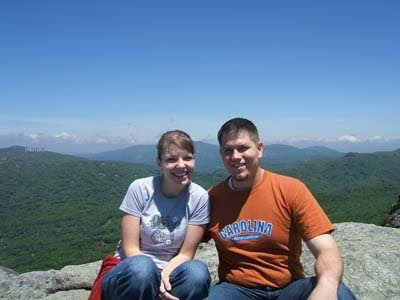 Eddie graduated in 2001 and began his ministry as a sort of intern at the Wesleyan Headquarters in the Evangelism & Church Growth department under (now a General Superintendent) Jerry Pence. Then he spent two years as the youth pastor at Mt. Zion Wesleyan Church in North Carolina before moving to IWU’s sister school, Southern Wesleyan University where he has worked in admissions since 2004. I’ve always sort of seen Eddie as a church planter—he has just the sort of personality that attracts people and he has always been able to “call out” people, which is why he’s been good at admissions I bet. It has been nine years since Eddie graduated and every one of his profs still remember him well. That’s saying something—after all since Eddie graduated from IWU we have had more than a thousand students pass through the Religion Division (now “School of Theology and Ministry”). But if you know Eddie that’s not hard to imagine. Eddie we are all proud of you! Kelsi Adkins had a double major at IWU (Christians Education & Worship) and was always alert and full of energy in her classes. We all missed her when she graduated in 2008. 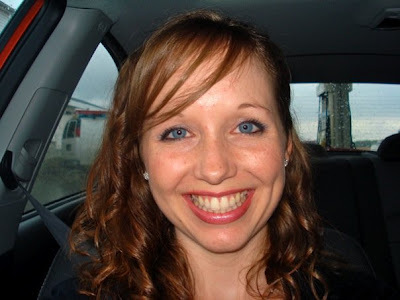 When she was in college she did her practicum work at Hanfield UM church and also worked in her home church over a couple summer in Chillicothe, Ohio. When she graduated she moved to Indianapolis where she got an apartment with Kelly Reynen. With her CE degree she passed the tests and becmae a teacher in Indianapolis Schools and also did some preaching on the side as she worked on her Master’s degree at Marian College in Indy and she juggled several options for her life’s calling. When Kelsi moved to Indy she started attending Grace Pointe Church of the Nazarene on the west side. She had been attending there for a little over a year when the pastor preached a sermon where he mentioned about the need for our church to hire a children’s pastor. This church had never had one before, even though the church is a fairly good size. In that service Kelsi heard the Lord spoke to her about this opportunity. So she approached the pastor immediately after that service. So this CE-Worship graduate who was now a public school teacher interviewed with the board and got a unanimous vote. Kelsi is one of those students who finally settled her call to the ministry after graduation, though she sensed it before. As a single woman in ministry she has faced some challenges. Just six weeks after she took over as a pastor a family of seven left the church because the husband refused to be under her leadership in the children’s department since she was a woman. But she has an incredibly supportive and mentoring senior pastor who takes such things in stride. Here’s the way she puts it: “I won’t sugarcoat things, but I can say that denying the call would be much worse than braving the opposition.” Kelsi I’m proud of you! Craig Coe is the Executive Pastor at Cherry Creek Wesleyan Church in Colorado. 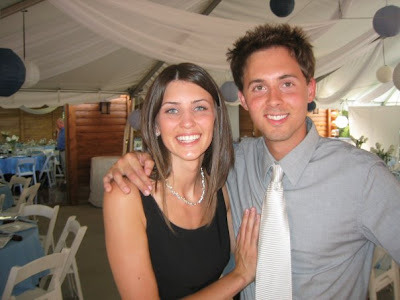 He graduated from IWU in 2002 and his first job was in Flatland Indiana with IWU Admissions. As a student he did all of his practicum courses at Lakeview Church in Marion —one each with the senior pastor, assistant pastor, college pastor and music pastor so he could see all aspects of the work—a great idea. He and his wife (Priscilla Ruder Coe) moved to Colorado in starting out as Pastor of Discipleship at the new “Summit Church.” He led the small groups, special classes and seminars, along with leading the marketing and technology aspects in the new church plant. When the lead pastor of Summit church left in 2006 Craig took on the role of lead pastor. He’s a good example of someone who was happy to be a staff pastor and wasn’t that interested in taking on the mental and emotional challenges of being a lead pastor—but when God and the church called him to it, he stepped up for the next three years. Later two Wesleyan churches merged (Summit Church and Cherry Creek) and Craig became the executive pastor of the merged church. As exec pastor he oversees the financial and organizational structures of the church and also leads the preschool-daycare. He coordinates the weekend service and is leads the church’s marketing too. Of course he does other things all pastors do, like leading a small group for young families. I’m jealous of Craig because he lives in my favorite state. I’ve been trying to get IWU to move to Colorado but so far I’ve been unsuccessful—we’ve built too many new buildings in Indiana I guess. But I do visit Colorado! A few years ago Jeanie Arg ot, Burt & Mason Webb, and I hiked a section of the Continental Divide and Colorado Trail and Craig picked us up at the Denver airport and dropped us off up in the mountains for our three week trek. We almost persuaded Craig to just leave the car at the road and join us! One of Craig’s good friends is Nathan Lamb—who now works at Wesley Seminary here in Marion. So every time I see Nathan I remember Craig and Priscilla. Craig and Priscilla have some kids but I forgot how many—they are great parents (I hear from Melissa “Rudy” who is always talking about her sister). I still remember Craig form classes—but more so, I picture him in Colorado where I always dreamed of planting a church myself! Thanks for living my dream for me! Craig, you bring great meaning to my life and I’m proud of you! Steve Abel graduated almost five years ago, in 2005. I think maybe I was the first person he "interviewed" when he was decising to come to IWU. That was back when we were first founding the worship major--and I was teaching all the worship courses. I loved having Steve in classes because he was always in tune with whatever was being taught—smiling, nodding, and “getting it.” It least he always looked like that to me! He was very active as a student in ministry—not waiting until he graduated to get involved. Steve did his practicum at Eagle Church in Indianapolis (where Ian Swyers is now--see entry below). Amber, his wife took a bunch of my classes too—she was always a happy student who reliably offered some clever and sometimes irreverent comment before, during and after classes. Wheneve I saw the printout of students and saw her name I knew it was going to be a fun class. Amber was always freezing at IWU—invaribly bringing a blanket to class to curl up in! When they got married I expected Amber to persuade Steve to move someplace warm, but they went to serve at the Sidney Ohio First United Methodist Church. He worked there for almost 2 years when Heritage Wesleyan Church in the Quad cities snatched him . I think Mark Schmerse who worked at Heritage at the time contacted Steve first and linked up the church and Stave (more about Mark in a previous entry here). That reminds me how networking is important—you never know which of your former college buddies might hook you up with your next church. Steve is the worship pastor at Heritage church now. 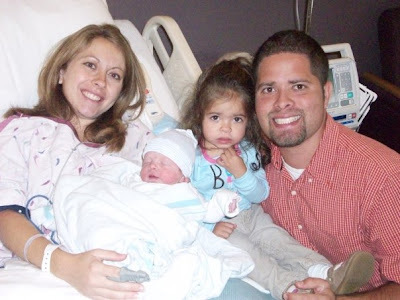 Steve and Amber now have a little boy, Lincoln. I think Steve was instrumental in beginning the new Heritage "Bettendorf venue" (their 2nd Campus) initially, though now it is led by the campus pastor for Bettendorf. He still selects all music for the campuses except his youth worship leaders select their own music for youth programming. Steve is a genius at event planning and plays a major role in the creative planning process and stage design for the large Christmas and Easter events. When Styeve was a student he led worship too—and that’s exactly what he does—leads others in worship. It is not a watch-Steve-sing performance but worshipping God together as Steve "prompts." Every time I have been in a service led by Steve he has helped me connect with God. I loved Steve and Amber when they were students and I was proud of them then. Still am! I’m proud of you Steve and Amber! Ian Swyers and his wife Danielle graduated 2006. Ian was a doule major--Business Administarion and Christian Ministry. I had Ian as a freshman first, then several times later. As a student he worked at College Wesleyan Church during the school year and in the summers he worked at Skyline Wesleyan in California and Spring Lake Wesleyan in Michigan. 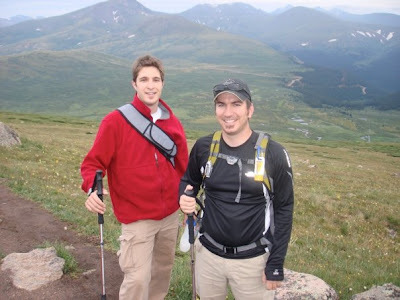 When Ian and Dannnielle graduated he went to Indianapolis to work with Clint Ussher as a Co-Student Pastor of 6-12 grades at Eagle Church (Christian & Missionary Alliance). Two years later Clint left for Princeton Seminary and Ian took over as the Student Pastor for grades 5-12 He’s been at Eagle Church for about 4 years now. Ian was gifted high school student himself—he was known as a strong Christian in a public high school. Now he leads other teens to become this sort of witness in their own schools. He is creative, industrous and a great youth speaker. He cruises through our campus a few times a year interviewing students to join him as interns. I always urge stuents to link up—he is a master at youth ministry and has lots to teach. I’m proud of Ian and Danielle.